The days of “sustainability” meaning “biofuels made from conventionally-grown corn and soybeans” are long behind us — thank goodness — but many researchers (and energy companies) are still exploring ways to clean up the fuel that goes into our transportation. Sustainablog‘s Talancia Pea came across one experiment that’s well underway: United Airlines has partnered with a company developing biofuels from food and farm wastes. The airline will be testing a blend of conventional and waste-based biofuel on passenger flights this Summer. Advancements in the biofuel industry are responsible for the latest headlines in aviation news. United Airlines is partnering with California-based Fulcrum Bioenergy to make alternative jet fuel from food scraps, farm waste, and animal fat. United’s $30 million investment into biofuels is a strategic move with potentially big gains. Fulcrum CEO E. James Macias predicts that the sustainable fuel will lessen United’s carbon emissions by 80 percent and cost under $1 per gallon to produce. And it’s no coincidence these changes are underway now. Last month the Environmental Protection Agency (EPA) concluded that airlines’ flight emissions pose a “risk to human health.” Stricter government regulations may be adopted next year if leaders on both sides can’t compromise on a standard of limiting carbon pollution. While Fulcrum continues building its biofuel refinery scheduled to open in 2017, United will begin testing the first-ever passenger flights powered by all-natural fuel later this summer. The flights will travel from Los Angeles to San Francisco carrying AltAir’s biofuel. The tanks will be filled with 30 percent biofuel and 70 percent traditional fuel. If successful, the biofuel then will be blended into the airline’s general supply. As one of United’s partners, AltAir Fuels has plans to produce up to 15 million gallons of biofuel for the airline over the next three years. This will be enough to fuel 41,600 flights. The benefits of creating biofuels from organic materials don’t stop here. Next, I’ll explain how this also is a significant step towards repurposing the tons of wasted food in landfills. Experts estimate that food waste makes up about a fifth of the garbage rotting in our country’s landfills. We are throwing away more food than plastics, paper, metal, or glass! The decomposing food then releases methane gas, which is about 20 percent more harmful than carbon dioxide, as explained in an article published by the Washington Post. If your mind would allow it, try imagining what 35 million tons of leftovers smell like as it breaks down. That’s one stinky pile! Sadly if American families continue throwing away food at the current rate, United will have no problem finding enough raw materials to produce its biofuels. The airline has 20-year collection agreements with municipal waste management companies, including Waste Management. Take a look at this infographic further explaining the cycle of how household and farm waste will become jet fuel here. As United join ranks with Alaska Airlines, Southwest Airlines and British Airways to invest in the future, I think this move is ready for lift off! Biofuel production creates more jobs, reduce landfill waste and in turn better air quality and health for us all. 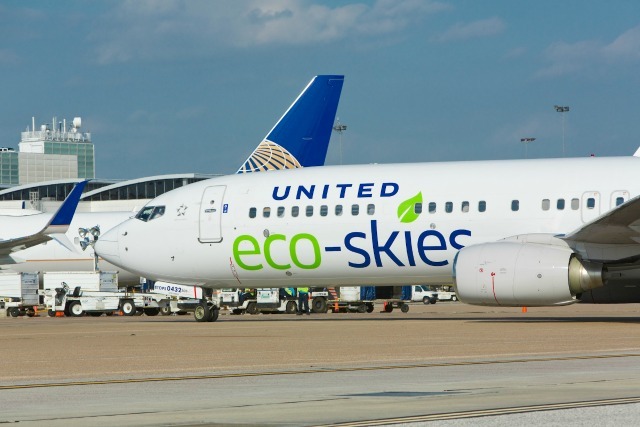 What do you think United’s investment into biofuel technology? Do you think it has promise of becoming a lasting aviation fuel source?